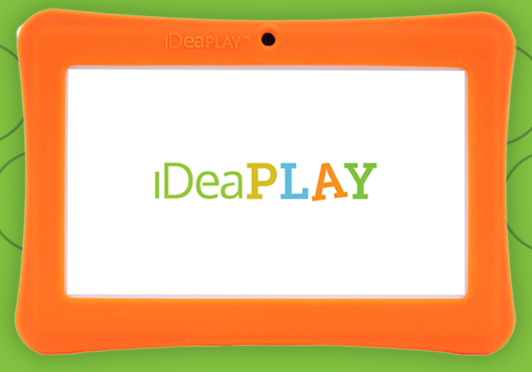 iDeaPlay Tablet – Fun & Educational Tablet for the Holidays! I love my Kindle. I love my iPhone. I love my iPad. Sadly the kids all love them too, but my devices are not made to take the beating that kids tend to dole out and not only that they’re set up for me and not kids. It’s amazing the things that a kid can find on YouTube or just the internet alone when left to wander aimlessly around. With all of the tablets out on the market there are only a few that are really focused on kids and their needs. When I was given the opportunity to take a look at this new tablet I jumped at the chance and I have to say that I was not disappointed at all. COPPA compliant – The iDeaPlay is programmed to abide by the U.S. government’s Children’s Online Privacy and Protection Act. This ensures the safety and privacy of kids under 13 years old. Educational – As a parent you can easily configure the content to help your kids learn in a fun and engaging way. They’ll never realize that they’re learning! Durable – The table includes a sturdy case to help protect it against rough play and helps kids keep a better grip on it. Famigo – This app creates a safer, fun mobile environment for your kids! It includes content from some of the most popular kids characters like Cat in the Hat Knows a Lot About That, Jim Henson’s Sid the Science Kid, and more. Apps – Kids and parents can safely download apps for free or for a cost from the iDeaPlay marketplace or by going to Amazon. Kids can build a wish list of apps that they want, but can’t make purchases. Gain full control over which apps and content your children can view. Parents can set a time limit on kid’s play time. Receive email notifications with lists of new, desired apps from your children. Turn off Parental Controls and the iDeaPLAY becomes a simple 7 in. tablet. Preloaded with Doodle Jump, Shrek Forever, My First Zoo Kids ABC Alphabets, Color & Draw Math Bugaboo. This tablet has tons of features that will keep your kids as well as you entertained for hours! I was able to easily download Netflix and a couple other apps that are my favorites as well ones that my tween daughter likes. If you’re wondering…. Yes, I would definitely recommend this tablet if you are looking for one for your kid for Christmas. Couple of things though. It did take me a few minutes to figure how to turn it on (then I realized it needed to be charged first) and weak battery about 3.5-4hrs of moderate usage. Like any new device though you just need to get used to it, how it works, and the interface. I found it very easy to play the games that were included, search the store for more games for my kids, and get them installed. 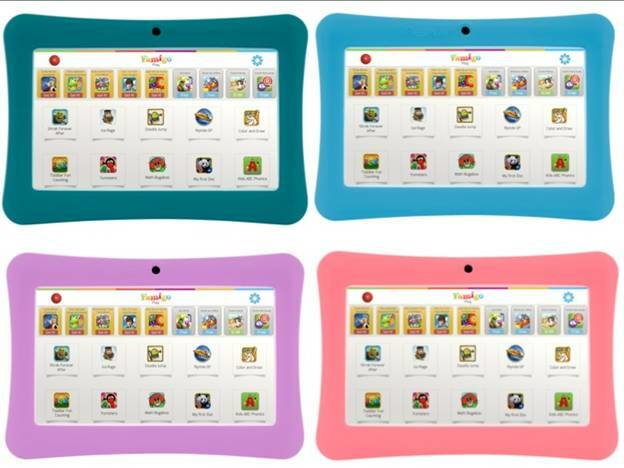 Normally priced at $129 the iDeaPlay kids tablet will be on sale for only $99 on Black Friday at Amazon.com!! By entering the promo code ‘ideaplay’ at checkout, you will save $30 when purchasing the safest and most versatile Android kids tablet on the market! Also, you can now personalize your iDeaPLAY tablet with new protective bumpers in blue, green, pink, or purple instead of the typical orange that it comes with. These are also on sale now at Amazon.com. Check out the iDeaPlay website, and of course keep you with them on Facebook and Twitter. Disclosure: I was given an iDeaPlay tablet to for this review. All thoughts and opinions are my own. 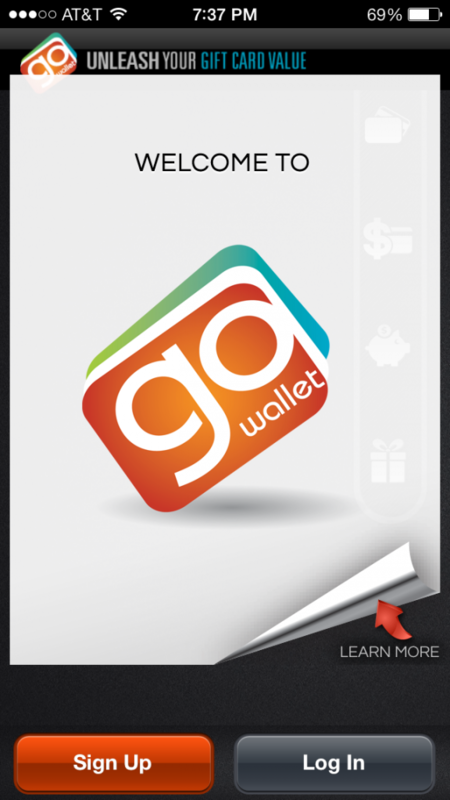 GoWallet Review – Get those gift cards organized! So with the holidays coming up we all need a way to keep those gift cards that we are given organized as well a better way to figure out what the balance is, right? I know that trying to figure out the balance is always a challenge and I usually end up keeping the most receipt wrapped around the gift card. Honestly, that is not the most effective manner of keeping track. I’ve found one of the best ways to keep track now. GoWallet! 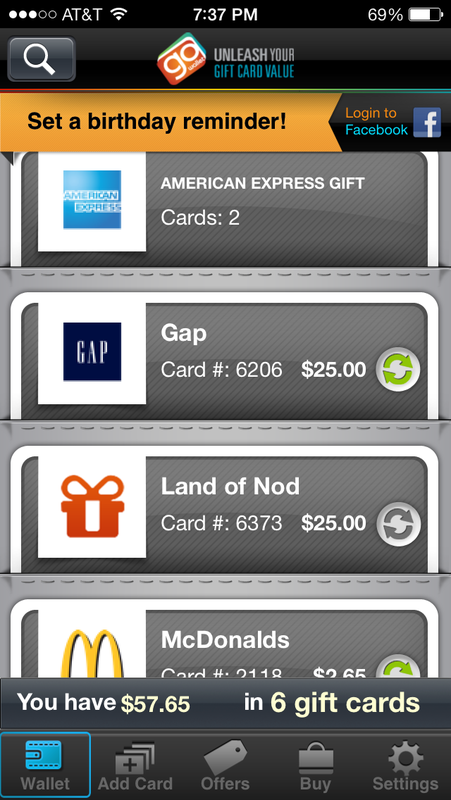 This app has made it so easy for me lately for the few gift cards that I do have that I can’t wait to add more to it during the holidays! 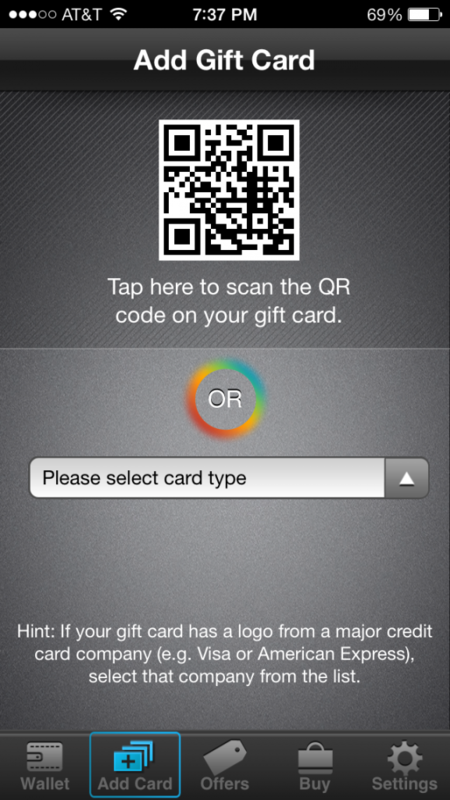 The first thing that you need to do after downloading the app is to create an account and then start adding your gift cards to the app by scanning the card or inputting it manually. Really it takes just a few minutes to do it manually and you can update it easily after that. Once you have it all set up you you can start shopping! For most of the stores you don’t even need the actual card… but don’t get rid of them since there are some that do require it. As you use the card you can update the value of the card too by simple pressing the arrows in a circle icon. The GoWallet app will tell you how many cards you have, the balance of the cards, and a total of all of them combined. GoWallet has the added feature of allowing you to buy gift cards from major retailers, restaurants, and other service providers right through the app. When you purchase one you can either add it to your GoWallet account, email it to a friend, or send it to someone via Facebook. 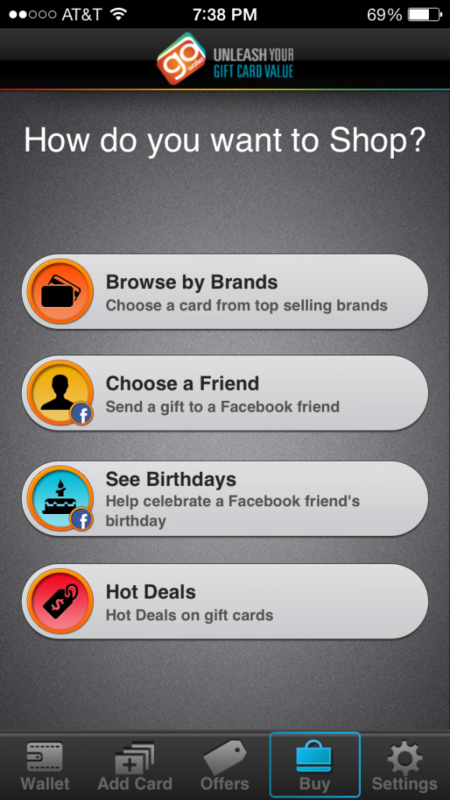 Sending gift cards to friends and family across the country or world just got a whole lot easier! Tell me…. how do you keep track of all the gift cards that you and your family gets at the holiday? Disclosure: I was provided a gift card in return for my review of the app. All thoughts & opinions are my own. I love shopping and finding great deals but I have found something that is better than window shopping! Have you heard of Modnique? It’s a deal website that offers some incredible brands like Chanel, Tory Burch, Hermes, and so many more up scale brands. You know… the brands that we window shop for because the price tags are usually high. With Modnique the prices are up to 85% off and new merchandise arrives daily and is featured in 36-72 hour events. Right now they’re having a great promotion going on… 20 Days of Deals! These items go super fast too! I was stalking an iPad mini going for $99 and wasn’t able to grab one. 🙁 The new deals are revealed at 6am PST every day and you can keep track of the new deals by checking out their blog or Facebook page daily. I have spent a great deal of time on the site looking for some Christmas gifts but then I was sidetracked and found myself with half a dozen tabs open of things that I wanted for myself! The prices on all of these are really affordable too! 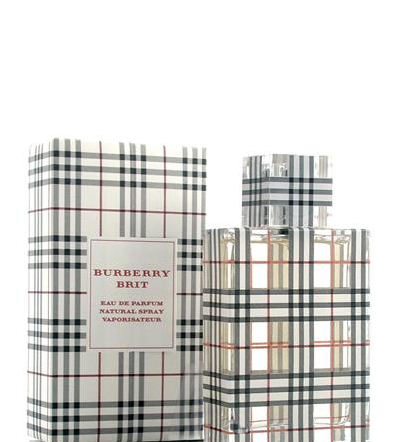 The Burberry perfume is only $29 after a 60% discount!.Well, maybe the necklace is still pretty expensive (only $1889 after a 54% discount) but it is gorgeous, isn’t it? I will say that finding the right item can be like a little treasure hunt. Sometimes the item you want is already in someones basket or they don’t have it in your size, but with the variety that they have I’m sure that it won’t take you long to find something that you absolutely love. This is how it works; you pick something that you want, click to add it to your cart, and then you have a limited time to purchase it or it goes back on the virtual sales floor, giving some one else the chance to buy it. You get a little countdown clock to help you keep track which makes it easy for you. So if you can’t find me today it’s because I’m doing a little window shopping for things that I don’t really need but really, really want! Like the blue boots that I found by Marc Jacobs…. or the Hermes shoulder bag. This review is part of a Splash Creative Media campaign on behalf of Modnique.com and I have received a gift certificate for the purposes of this review. All thoughts & opinions are my own. Shhh…. don’t tell anyone but this post is a day off. I usually post Fall Favorites on Wednesday and Friday and the whole not having power for over 3 days through me off. Living in the dark is no fun at all! Today Heidi Jo from Simplee Thrifty is here today with a super simple cookie recipe. It’s a twist on your favorite chocolate chip cookie because it’s made with a cake mix and pumpkin! 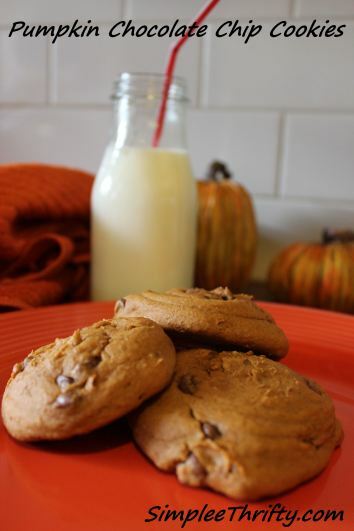 Pumpkin Chocolate Chip cookies will be one that you add to your recipe box for sure. Heidi Jo has a great deal blog with tons of information on couponing, reviews, giveaways, and great deals in Michigan. Make sure that you check her out on Twitter, Facebook, and Google+ for all the deals. See! Didn’t I tell you that they were simple cookies? Michigan is full of the holiday spirit starting this upcoming weekend! There is so much to see and do with your family that picking one holiday event might be difficult. Let’s break it down by area. On December 22nd you can see the Nutcracker Ballet performed by the Moscow Ballet at the Detroit Fox Theatre. This is one show only and definitely something that you don’t want to miss! America’s Thanksgiving Day Parade: Floats, bands, giant balloons, and celebrities. If you can’t make it to downtown Detroit to see it you can always watch it on TV from the comfort of your couch. Detroit Zoo Wild Lights: The zoo lights up with an amazing light show! For 24 nights, more than two million LED lights will illuminate trees, buildings and animal sculptures on a half-mile trail through the front of the Zoo. The Big, Bright Light Show: Downtown Rochester lights up and will be covered with more than 1 million points of glimmering holiday light. Holiday Nights at Greenfield Village: Step into the past with carolers, candle-lit paths, horse drawn wagons, and of course Santa and his reindeer. The evening is topped off with a fireworks display too! Christmas at Crossroads: This is the one place that we visit every single year for Christmas. The village has carolers strolling around, beautiful lights (you MUST see the tree that is fully covered in lights), and the trip is not complete without riding the old locomotive and seeing Santa. Nutcracker present by FIM: We have been trying for years to get to this and have yet to make it. There is always some reason why we haven’t gone yet but this year we will go. This show features professional dancers from New York City’s Collage Dance Collective, talented students from the Flint School of Performing Arts, and the Flint Symphony Orchestra. Holly Dickens Festival: Starting right after Thanksgiving visitors to downtown Holly will be greeted by performers taking you for a trip through Charles Dickens’, “A Christmas Carol”. The Holiday Pops: For two nights you can celebrate the holiday season with music and song from the Flint Symphony Orchestra, Flint Festival Chorus with members of area high school choirs, Flint School of Performing Arts students and additional musical groups. North Pole Express: This is really in Genesee county…. it’s actually Shiawassee county. But it’s really the only event going on in the area. But is so worth sharing! The 1225 has been fully restored and is the exact steam train that was featured in the movie The Polar Express. I’ve seen this train in person… it is incredible. The Nutcracker 2013: This is the 33rd year that the Nutcracker will be performed at the Wharton Center and features the Children’s Ballet Theatre of Michigan and some of mid-Michigan’s best young dancers. Silver Bells in the City: This weekend, November 22nd, the city will be glittering with lights, a parade, the lighting of the tree on the steps of the Capital, and then a fireworks display all to start off the holiday season. Wharton Center: The Wharton Center on MSU campus has several events going on for the holiday season. Holiday Pops Series, Vienna Boys Choir: Christmas in Vienna, and MSU’s Home for the Holidays. This is just a handful of events that are going on around Michigan to celebrate Christmas in Michigan. To find something different or closer to you check out the Pure Michigan site where they have a huge list of holiday events from all over the state. Are you checking out any of the holiday events where you live? With the holidays fast approaching getting things done and keep up with blogging can become a challenge. But I think that I might have a way to keep organized, make notes, and write blog posts on the go no matter which computer or device I’m using. Are you intrigued? With Office 365 I can write a start a blog post on my phone while driving to to and fro (not me driving… that’d be unsafe!) and when I get home finish up on my computer (either the Mac or Windows computer). Once I have it all edited I can toss it into WordPress and be on my way to the next event… or bed… or work. Or with One Note I can collaborate with my sister in Virginia on the menu for our family Thanksgiving this year. As well as make plans for our Black Friday shopping… where to shop, what we need, and of course mapping out all the coffee shops for my sister. Honestly, I don’t think that there isn’t much that we won’t be able to do with Office 365 to help us get through the holidays this year. Office 365 lets you work while on the go. 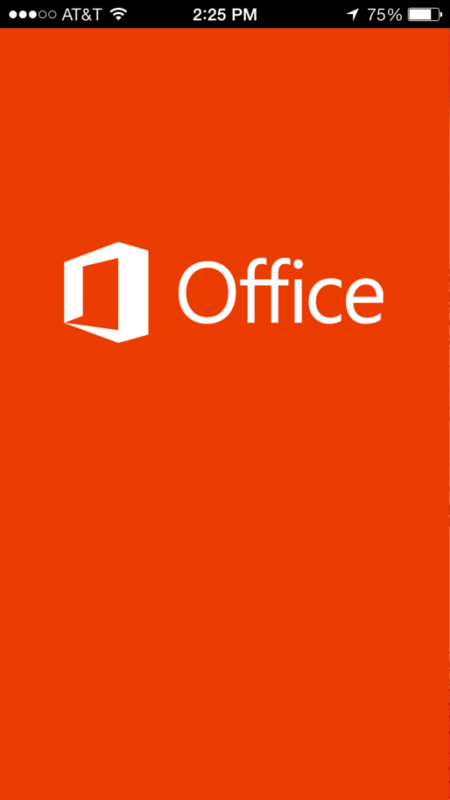 No matter where you are and when you save something to the cloud on your Sky Drive you can then access it on any device that you have Office 365 installed on. Life just got easier too, because with one subscription you can put Office on up to five PCs or Macs and five phones (iPhone or Android)! I was a little sad when I saw that they didn’t have an app for my iPad but I have hope that they will soon. This is especially useful since the 9 to 5 has blurred and today people need modern technology to find balance. From the home to the office, and especially on the go, people all around the world are working differently than the past. Even where I work more and more people are starting to work remotely and still collaborate on projects. I find myself working on various documents, checking email, and making notes no matter what time of the day it is. Especially in the evening after the kids have gone off to bed for the night and it’s quiet. That’s when I can really make some progress! Now for the giveaway part! One winner will win a one-year subscription (US $99.99 value) of Office 365 Home Premium. Sorry… US readers only. Just use the Raffelcopter form below to enter. Don’t forget the #GetItDone contest on Facebook where you can enter for the chance to win an all-expenses-paid trip of a lifetime. Show Microsoft how you #GetItDone. You and a friend could win a trip to some of the most happening events anywhere. Get it done alongside the most accomplished athletes, filmmakers and musicians around—on a trip to NYC, a journey to Park City, Utah, or a musical voyage to Austin, Texas. I participated in the Microsoft Office 365 campaign on behalf of One2One Network. All opinions stated are my own. Happy Friday! Today one of my best online friends is here sharing a delicious, warming recipe with you…. pumpkin spice hot cocoa! Perfect for these cold evenings that we’ve been having too. I’ve know Jill almost as long as I’ve been blogging I think and we’ve been great friends almost the entire time. One of the best things about online friends is how quickly they can become the closest and best friends you ever had. This has to be one of my favorite reasons for blogging…. the friendships. They alone are worth all the time and effort that we put into blogging. Jill is an awesome mom to three incredible boys (19, 17 and 10-going on 32). Two of whom still live at home. And fill her social calendar faster than she can… I can attest to this too! Just check out her on Facebook, Twitter, or Instagram and see all of their travels, adventures, and of course the great money saving deals that she writes about on her blog, Single Mom on a Budget. Temperatures are dropping, snow is starting to fall and the trees are near bare. Halloween candy is a distant memory and Thanksgiving and Christmas are on the mind. Here in Colorado we have already had snow twice and because of that we had a beautiful fall season. The ‘pretty’ is over though, and the ground is covered in leaves. (And by covered I mean I’ve done the back-breaking job of bagging a total of nine trash bags full so far and it ain’t over yet.) The days are beautiful, but the nights are downright cold. Something about that – the temps falling part, not the leaf bagging part – has gotten me in the holiday spirit early this year. And that never happens so I’m enjoying it. As we settle in one chilly evening I had visions of cinnamon sticks and cans of pumpkin dancing in my head so I whipped up a pumpkin spice hot cocoa concoction and ooh la la it is delicious. Even my picky 10 year old liked it. And by picky I mean he won’t eat mac n cheese, peanut butter and jelly or cupcakes. I KNOW. You can make your cocoa one of two ways, from a little packet or from a homemade hot cocoa recipe that we’ve used in my house for years. I make it and store it in a mason jar (recipe below). These directions are per cup of hot cocoa. Heat milk on stove on medium-low and watch so that the milk doesn’t boil over, because speaking from experience that is a big mess. It can also be heated in the microwave. I like to drop a cinnamon stick in it to infuse the milk with cinnamon. Pour milk into your favorite mug and add about 2-3 tbsp of hot cocoa mix depending on how chocolaty you like it. Add 1 tbsp of pumpkin and mix thoroughly. Add more/less to your taste. Add a dash of cinnamon and a dash of nutmeg. Top of with a big dollop of whipped cream (or marshmallows) and sprinkle with nutmeg. Hey there! Welcome to Wednesday and another Fall Favorite. Today I have fellow Michigander, Ashleigh, guest posting today! I have had the pleasure of meeting her and have to say that she is one of the sweetest gals ever. Sadly, even though we’re less than 2 hours away from one another, we don’t see each other all that often. 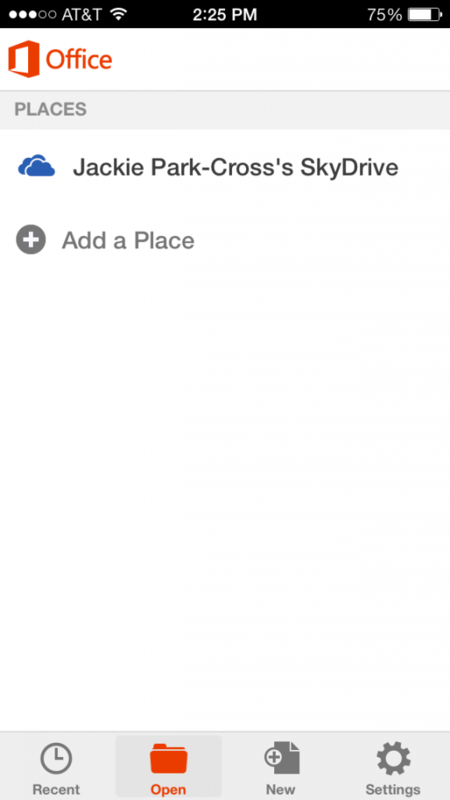 I think that it’s time to remedy the meeting up with bloggers who live close by issue…. So what is her Fall Favorite? 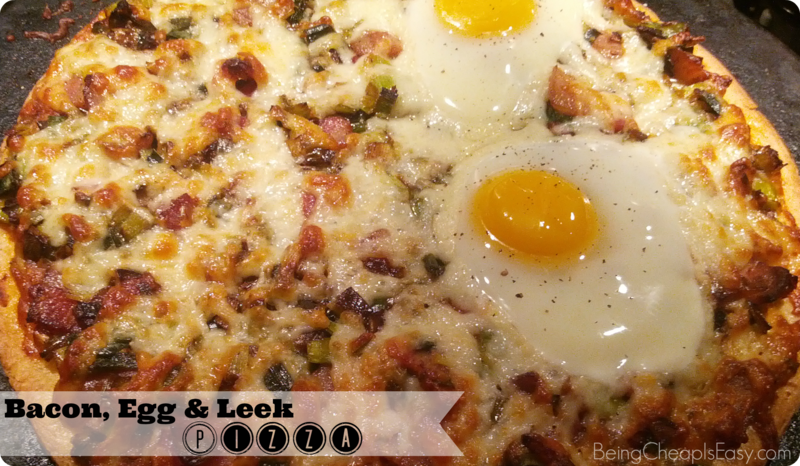 Bacon, egg, and leek pizza! Yum! Aside from living in the great state of Michigan, Ashleigh is the mom to 3 little girls (toddler twins and a baby), wife to a great man, and a doggie mom too. She blogs at Being Cheap is Easy where she shares tips on how to save money online and in stores, reviews & giveaways, and food & recipes. Follow her on Twitter, Facebook, and Pinterest to get all the updates on the great deals she shares and Instagram for a glimpse into her life with 3 little ladies. Hello! My name is Ashleigh and I blog over at Being Cheap is Easy. I am so excited to be guest posting over at Jackie’s blog…I’ve been a reader for quite some time now! Since we have a family of 5 and a tight budget, we rarely go out to eat. It’s helpful that I love to cook! One of our favorite “make your own takeout” meals is pizza. My girls love the basic pepperoni, but I like to experiment. This pizza happened one day by accident and now it’s our favorite! If you’re not familiar with leeks, they have a sweet, mild flavor after cooking…there isn’t a strong onion taste. During a hectic week, it’s great to have a store bought pizza crust on hand to get dinner on the table in a flash. 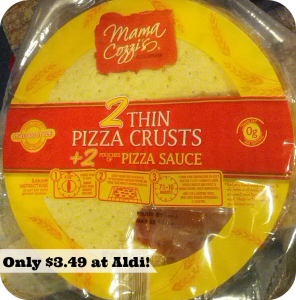 My favorite: the Aldi thin crust. It is cheap, yet it doesn’t taste like cardboard. If you don’t have an Aldi in your area, any thin crust will do. You can even make one if you’re feeling ambitious! Here’s how to wash leeks. You can also find them cleaned in the produce section. Slice the bacon in thin pieces and cook in a pan, draining most of the grease. Remove from pan and add leeks. Cook until soft (3-5 minutes). Mix pesto and pizza sauce, add to crust. Use more or less sauce, depending on taste. Sprinkle cooked leeks onto pizza crust, and then add bacon. Top with cheese. If you’re feeling adventurous: add 2 eggs before putting it in the oven (like a sunny side up egg). It sounds crazy, but it really does taste amazing! Bake 12-15 minutes, or until golden brown. What crazy toppings do you like on your pizza? Get your Disney Classics soon!! This past spring we took a trip down to Orlando and spent some quality time at the Disney Parks. It was another truly magical trip to Disney… there really is nothing that I don’t like about the Magic Kingdom. Wait, that’s a lie. I don’t like all of the huge crowds. Even with the crowds and people milling about everywhere there is a way to see and do just about everything. Part of the magic of Disney is the music. Every where you go there is classic Disney music playing through well hidden speakers…. seriously, I have never been able to actually spot one. Each area had music playing that went along with the theme too! The box set is currently available for pre-order on Amazon.com and available on the official release date, November 12th. It is also available for purchase in the Disney parks just in case you’re there. 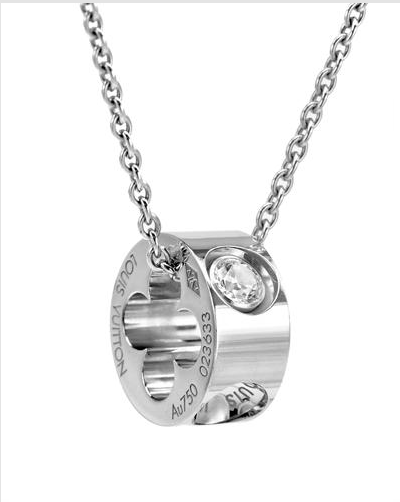 It’s the perfect gift for the Disney fan in your life too! There is special bonus for those who buy the box set too! There is a new medley of Disney hits by YouTube a capella sensations Peter Hollens and Alex G. Peter and Alex create fully orchestrated songs using only the sounds of their voices. Disclosure: I am participating in a blog post campaign from One2One Network and Walt Disney Records. All opinions are my own. Happy Friday! Today I have Amanda here from The Sunny Vegan sharing a tasty recipe. 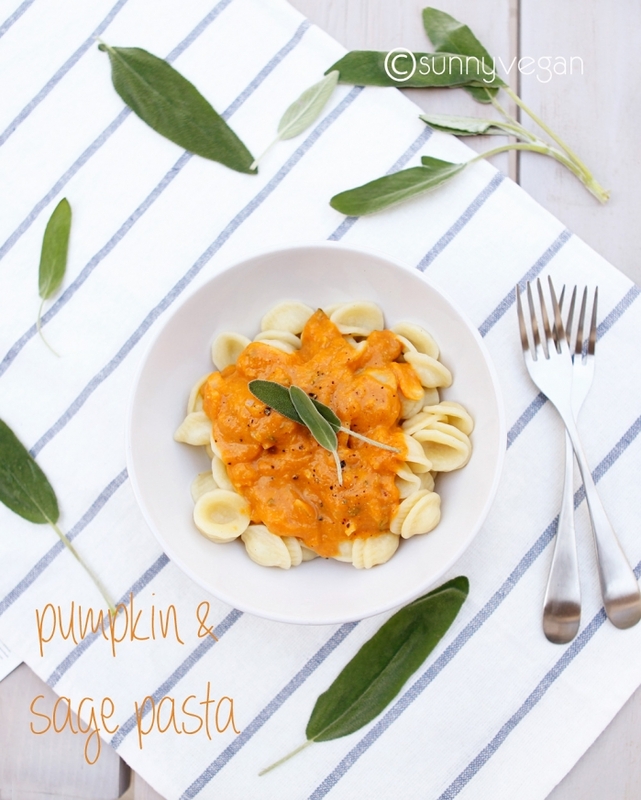 What I love about her pumpkin sage pasta is that it’s just like a pumpkin ravioli but made so much easier and much healthier than anything that you could get from the store or restaurant because it’s made fresh. I first met Amanda through an incredible Facebook group that we belong to and from there started slowly stalking her blog because I love food and she takes some awesome food pics! Amanda shares all sorts of delicious vegan recipes on her blog and you’ll love them… I know that I do. She is also a Certified Yoga Teacher and is pursuing Certification as a Fitness Nutritional Specialist and Holistic Life Coach. All that in addition to raising two beautiful little girls, Weimaraner and a cat. After you read her blog check her out on Facebook, Twitter, and of course Pinterest too! Think pumpkin is only for pie? Well think again! Savory pumpkin recipes are a fun way to keep the flavors of autumn around throughout the holiday season. Pumpkin is low calorie and full of Vitamin A, C and K as well as iron, potassium and magnesium so adding more to your diet is certainly a good thing. I ususally use whole wheat pasta but my daughter picked out the orecchiette because it reminded her of little pumpkins. It really held the sauce well which made me happy. pasta – prepare as directed on package. sauce – heat olive oil over medium-low heat, add onions and cook until translucent or approximately 5 minutes. add garlic and heat another 2 minutes. stir in pumpkin, almond milk, sage and nutritional yeast, salt and pepper to taste. heat over low heat for 5 minutes. serve over prepared pasta and garnish with additional fresh sage.